There are many natural supplements on the market right now promising women relief from menopause symptoms, so it can be a difficult endeavor to find one that truly works. New Chapter Estrotone is advertised by its manufacturer as a powerful herbal formula that combines the benefits of phytonutrients from organic sources to create a product ideal for achieving hormonal balance. We decided to take a closer look at this specific product. Here is our review. What Does New Chapter Estrotone Contain? The herbal extracts mentioned above are used as traditional treatments for menopause, and their effectiveness is supported by centuries of usage. However, there are other, more efficient products on the market that contain even more nutrients than these plants, and they also contain ammonium succinate, clinically proven to help women through the onset of menopause. The recommended dosage is two softgels taken daily with your meals. The retail price for a bottle with 60 softgels, enough for one month, is 33.95USD. We could not find any clear information on returns and refunds on the official website, so this may be something you will have to address to your reseller. 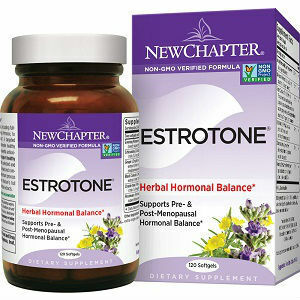 New Chapter Estrotone is based on natural herbal extracts with known benefits for treating various symptoms of menopause. From its formula, it seems to be a reliable product, and it is priced within the same range with other similar products. Still, more active compounds would have made it a better product. Jackie Horowitz	reviewed New Chapter Estrotone	on February 8th	 and gave it a rating of 2.5.